My dog, Izzy, sure is cute, but she isn’t the brightest pup in the land. So when she saw a skunk at 11 p.m. last night, she decided it wanted to play. Three peroxide, Dawn and baking soda bath’s later I’m pretty sure she regrets that decision. Well, I’d like to think that, but let’s be honest- if given the chance, she’d probably go back for round two. 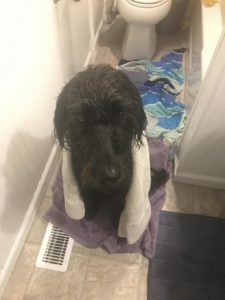 Want to know what is even better about my dog getting skunked? I didn’t realize she was sprayed until she had been in the house 10 minutes. When the putrid smell filled my nostrils after letting her in, I instead spent my time trying to figure out if the tenants upstairs were using Nair on their hairy man legs. That gave Izzy plenty of time to lay on two couches, two rugs and the carpet in the guest room. Want to know the even better part of the night? Brandon wasn’t even home – he was away recruiting. So my Saturday evening turned into me wrestling a 100 lb dog and calling Brandon with mental breakdowns every 10 minutes (which of course was very helpful). So here we are, 2 p.m. on a Sunday afternoon and I just sat down after deep cleaning the furniture and dog once again. Which really has me frustrated because I’ve been looking forward to Sunday all week – way more than usual. Because, honestly – I’ve been pretty anxious lately. And a day of rest sounds like something my soul needs. But as I sat here in this rank house of mine, I felt something deep within me begin to stir. This is the type of episode that confuses my husband. Because I have no idea what I’m feeling. On one hand I’m thinking this is devastating. And on the other – this is absolutely hilarious. Then I started thinking about everything that has had me stressed out and anxious over the course of the past two weeks. I’ve been so stressed out. But at the end of the day, isn’t life pretty good? I’m surrounded by people that love me, in a place that I love, with this little goofy family of mine that has formed over the past two years. Me, my husband and a smelly dog. Even if I don’t have a perfect five-year plan. Even if I am too busy to clean the house. Even if the dog reeks. And I have a Savior that loves me, even when I miss church. I can still rest, because my rest is in Him. And He is in me. I can rest, because my rest is in Him. And He is in me. Thanks for stealing my Sunday, skunk. 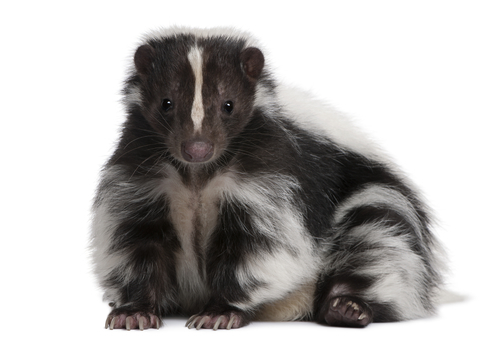 Question: Do you have any “skunks” trying to steal your rest?